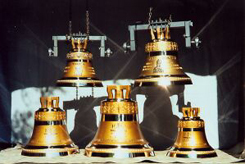 We are a founder company producing a wide variety of bells in accordance with the tradition of bell foundry craft known in the world since the XIIth century. 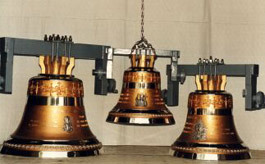 we also produce belfries that can be installed in a tower or placed in a churchyard. 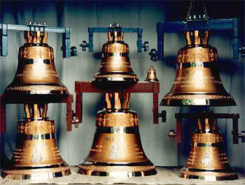 Bells are made by hand only; they are an alloy of 78% copper and 22% tin. Moulds are given great ornamentation, interesting colouring and they are equipped with both suspenders and clappers filling our bells with bronze tone. In our offer you can find a wide variety of sacral bells, their weight varying from 50 kilos to 2 tons and even bigger ones. Our offer includes different kinds of sets: both major harmonic and minor polyphonic ones, according to each client's requirements. 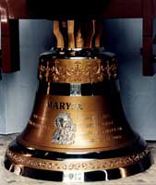 In our offer, beside big sacral bells, there are also small ornamented, commemorative (suited to the occasion) and naval ones, which we produce in variety of sizes for individual requirements needs. All the bells are decorated with suiting precise embellishments, taking into account individual needs. It is possible to make any kind of inscription or decoration, depending on its particular purpose. Bells constitute a special form of a mementos souvenir, or a gift commemorating an anniversary (for example Holy Orders) , wedding, First Communion, as a sign of gratitude with a special dedication. Two weeks is needed for a full realisation of small bells.